MJF Books. Used - Good. Shows some signs of wear, and may have some markings on the inside. Mjf Books. Hardcover. GOOD. Spine creases, wear to binding and pages from reading. May contain limited notes, underlining or highlighting that does affect the text. Possible ex library copy, thatâll have the markings and stickers associated from the library. Accessories such as CD, codes, toys, may not be included. Fine Communications, 1996. Hardcover. Acceptable. Disclaimer:A readable copy. All pages are intact, and the cover is intact. Pages can include considerable notes-in pen or highlighter-but the notes cannot obscure the text. The dust jacket is missing. At ThriftBooks, our motto is: Read More, Spend Less. Fine Communications, 1996. Hardcover. Very Good. Disclaimer:A copy that has been read, but remains in excellent condition. Pages are intact and are not marred by notes or highlighting, but may contain a neat previous owner name. The spine remains undamaged. At ThriftBooks, our motto is: Read More, Spend Less.Dust jacket quality is not guaranteed. Fine Communications, 1996. Hardcover. Good. Disclaimer:A copy that has been read, but remains in clean condition. All pages are intact, and the cover is intact. The spine may show signs of wear. Pages can include limited notes and highlighting, and the copy can include previous owner inscriptions. The dust jacket is missing. At ThriftBooks, our motto is: Read More, Spend Less. Fine Communications, 1996. Hardcover. Acceptable. Disclaimer:A readable copy. All pages are intact, and the cover is intact. Pages can include considerable notes-in pen or highlighter-but the notes cannot obscure the text. At ThriftBooks, our motto is: Read More, Spend Less.Dust jacket quality is not guaranteed. Fine Communications, 1996. Hardcover. Good. Disclaimer:A copy that has been read, but remains in clean condition. All pages are intact, and the cover is intact. The spine may show signs of wear. Pages can include limited notes and highlighting, and the copy can include previous owner inscriptions. An ex-library book and may have standard library stamps and/or stickers. At ThriftBooks, our motto is: Read More, Spend Less.Dust jacket quality is not guaranteed. Fine Communications, 1996. Hardcover. Very Good. Disclaimer:A copy that has been read, but remains in excellent condition. Pages are intact and are not marred by notes or highlighting, but may contain a neat previous owner name. The spine remains undamaged. The dust jacket is missing. At ThriftBooks, our motto is: Read More, Spend Less. Mjf Books. Used - Very Good. Very Good condition. Very Good dust jacket. 5th edition. New York: MJF Books, 1984. Index. 166pp. Wear boards, owner's name FEP, DK: wear extremities.. Hb. VG-/VG-. MJF Books, New York: 1996. Hardcover with dustjacket. Good condition. In 1921, a young Albert Einstein traveled to America to give four lectures at Princeton University, paving the way for a more complete acceptance of his theory of general relativity. These lectures are published together as The Meaning of Relativity, and were revised with each new edition until Einstein's death. Despite Einstein's profession that he thought without using words, his examples and descriptions of the relativistic world he perceived are clear and easy to follow. Includes an Index. ISBN: 1567311369. New York: MJF, 1984. Hardcover. fine/fine. Bound in the publisher's original quarter cloth and paper covered boards, spine stamped in gilt. Mjf Books. Hardcover. 1567311369 . New. New York, NY: MJF Books, 1996. 5th or later edition. Hardcover. New. Size=6."x8.5". Text Figures. (full book description) MJF Books, New York, NY, 1996. 5th Ed(Revised) NEW, Hard Cover, w/Dust Jacket. Size=6. "x8.5", 166pp + Index. Text Figures. New. Clean, bright & very very tight. No ink names, tears, chips, foxing etc. 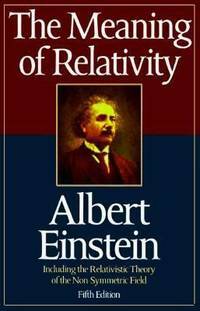 ISBN 1567311369 [Albert Einstein; Physics; Science; Relativity] SELLING WORLDWIDE SINCE 1987. WE ALWAYS PACK WITH GREAT CARE! MJF Books, 1996. Hard cover. Fine in very good dust jacket. Jacket shows light edge wear, small crease on back. Clean and unmarked inside with tight binding. Sewn binding. Paper over boards. Audience: General/trade. Mjf Books, 1997-07-01. 5. Hardcover. Used:Good.